This was my first attempt at making ramen. I love oxtail soup so I made a ramen stock using oxtail. It was a very rich and gelatinous soup, great for ramen. As usual, this is a very rough recipe- don’t follow it exactly- just do everything to your taste. To make the egg, boil some water and slowly lower the eggs (brought to room temperature) into it, and boil for 6 minutes (large eggs). Shock in cold water and to make it easier to peel, crack the shells a bit and leave in the water for a while. Peel and marinate (for a few hours to overnight) and a mixture of dashi, soy sauce, mirin and ishiri squid sauce. Equal parts dashi and soy sauce and flavor to taste with the rest. 1. Blanch the oxtail in water and drain, to remove scum. 2. Add water to the blanched bones and bring to a boil. Reduce to a strong simmer. 3. Add the garlic, ginger, scallion and onion after about 3 hours. 4. Keep simmering until the liquid reduces by a third (or is as thick and flavorful as you want). 5. Strain the stock and allow the stock to boil so that the fat and liquid emulsifies. 6. Remove some oxtail meat from the bones and reserve. 7. Mix the squid sauce, salt and mirin in the ramen bowl. 8. Boil some water to cook the noodles. While the noodles are boiling, quickly sauté the bean sprouts and chives together and season to taste with salt and black pepper. 9. Noodles should be cooked in 2-3 minutes (until it reaches desired texture). 10. Add 8-10fl oz of the oxtail stock to the bowl and mix well. Add more salt or stock if needed. Drain the noodles and fold into the soup. 11. 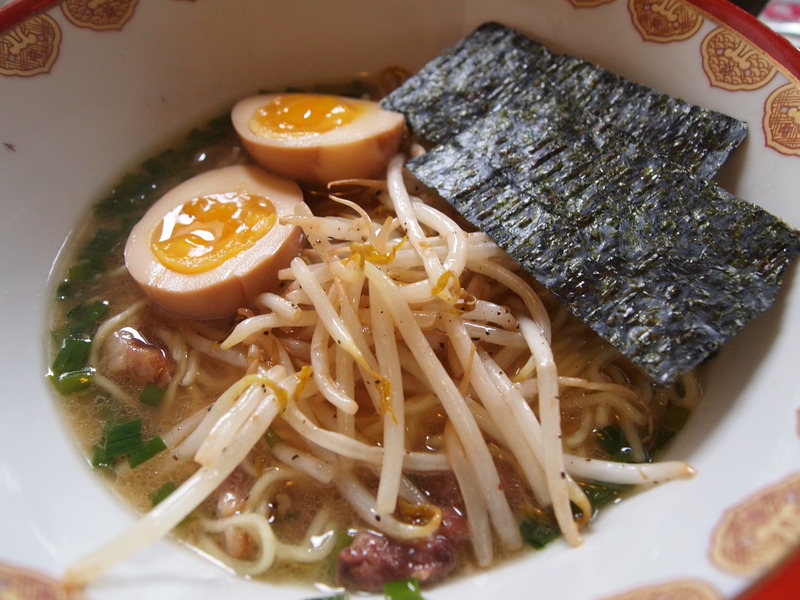 Top with the egg, bean sprouts/chives, nori and oxtail meat.